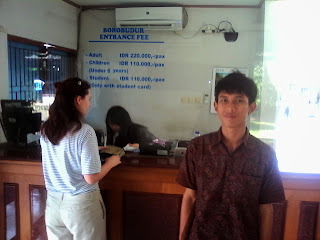 hire yogyakarta car rental with driver. Borobudur tour (started at 6 AM) can be accumulated with visit to mount merapi tour (10 AM-11.30 AM), sultan palace, and 1 more other tour destination in downtown Yogyakarta. Yogyakarta to Borobudur was majority tourism trip in Yogyakarta Tourism. Ninth-century Borobudur built, as the largest Buddhist monument in the world, is one of the most complex structures erected in ancient times. Built by Java's Buddhist rulers, it served as a pilgrimage point to teach the masses about the nature of human suffering, reincarnation, and enlightenment. This richly illustrated volume provides a comprehensive introduction to Borobudur's history and symbolism, including the Buddhist tales depicted in the 1,460 exquisite relief panels that line the lower terrace walls. Among Yogyakarta to Borobudur, we will pass Muntilan area, that many stone statue maker. Perhaps, they are generation from Borobudur statue maker in that time. Right now, they are not only make Buddha statue but also many things from stone. And if we feel tired and hungry after climb Borobudur temple even you allready given free mineral drink from Borobudur Park Management (see picture), we can enjoy various nice food menu at warung/kedai/small traditional restaurant - still inside Borobudur Park area like picture below, that warung was favourite for foreigners and also Indonesian. Indonesian traditional food menu, pan cake, etc. Then if you want to relax exploring villages arround Borobudur, you can hire "andong" (see picture with horse). You can see many rice fields, home crafts, and other scenery villages, while you sit on andong and also hearing the horse pull your andong.